Maria graduated in 2014 from the University of Tras-os-Montes e Alto Douro, Portugal. During her final year she completed an externship program at the University of Tennessee and spent two months in the cardiology service at the University of Liverpool Small Animal Teaching Hospital, where she established her interest in this area. After graduating, she initially worked in the north of Portugal and then completed an internship at the University of Tras-os-Montes e Alto Douro. After this before moving to the UK where she worked in a busy first opinion hospital in East Yorkshire. 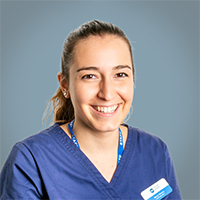 Maria decided to return to referral medicine and has done a rotating internship in a referral centre in Hampshire. She has started her Cardiology internship at SCVS in July and hopes to continue her training towards becoming a Cardiology specialist.